This is in car video from customer Larry Larson's quickest pass to date, a 5.95 @ 245mph in Las Vegas at the Street Car Super Nationals. 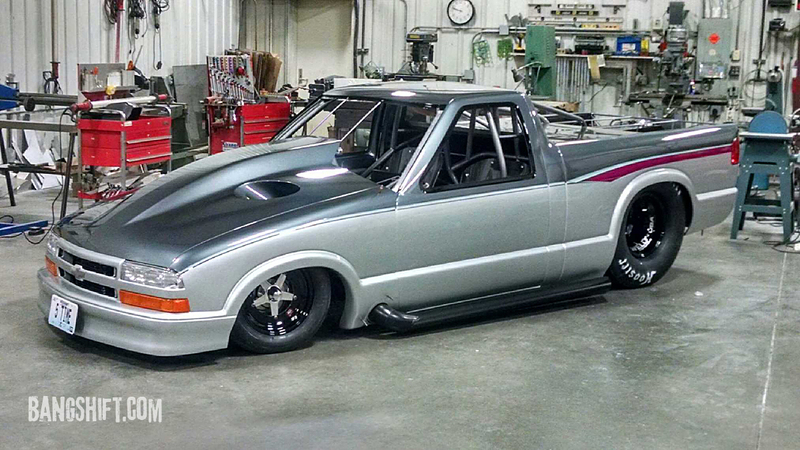 Larry's truck is based on a Chevy S10 pickup, built specifically to the rules of the Drag Week event, so it's licensed/plated/insured and covered 1400 miles on the street (pulling a 2800lb trailer, logging 9.5mpg) with ease. Engine is a Proline-built 620cid Chevy with a pair of 98mm Pro Mod 2 turbos from Precision. I can link an article to the build if anyone wants to see it. Meanwhile, here is a pass with some data. Interesting to see how slowly the boost builds, doesn't hit 50psi until nearly 4 seconds into the run. turbobaldur wrote: Interesting to see how slowly the boost builds, doesn't hit 50psi until nearly 4 seconds into the run. It is intentional for sure, bringing the power on gradually to avoid overpowering the tyres, as well as just using enough power to win the race.